Though keeping the photographic style of Flying Frog’s games, A Touch of Evil is set in America at the dawn of the 19th century—an age of science, superstition and witchcraft—and the hero characters can either co-operate or act independently to track down and destroy the supernatural villain that is threatening the secluded village of Shadowbrook. There are several villains to choose from that give the game a different flavour every time: the Scarecrow, the Vampire, the Werewolf, or of course the classic Spectral Horseman. 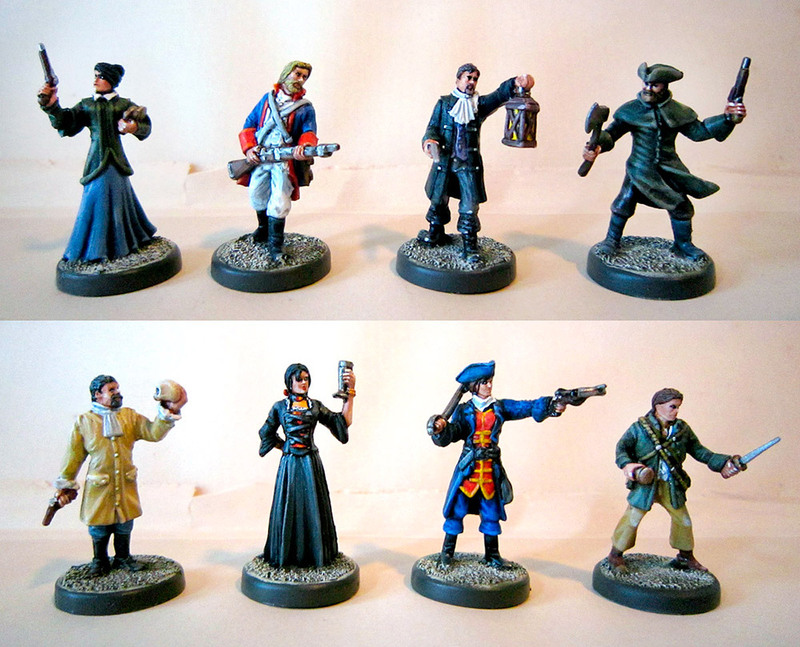 As for the dauntless heroes, you can choose from Karl the Soldier; Inspector Cooke; Isabella von Took, Noble Woman; Thomas the Courier; Victor Danforth, Playwright; Anne Marie the School Teacher; Heinrich Cartwright, Drifter; or Katarina the Outlaw. In addition, there are six Town Elders who may help or hinder you on your quest. A Touch of Evil can be played co-operatively and competitively, and the variety of villains, each with special powers and themed minions to do their evil bidding, makes for a different game every time. Things get even better if you add the expansion set, Something Wicked. Not only does this add more heroes and more villains (the bog fiend, gargoyle, banshee and the Unspeakable Horror), but there’s also an additional board, a slew of new variants, and even solo rules. Both games come with beautifully sculpted plastic figures for the heroes, which I highly recommend painting for the full experience. This file includes a summary of rules from the Something Wicked and The Coast expansions. Hi. Thank you for all that hard work you do with the rules summations. Any chance you may update these with the Coast expansion? I’d like to, but unfortunately my copy of ATOE is in storage at the moment so there’s no incentive for me to buy the expansion just yet—and I can’t find a PDF of the rulebook online. I don’t have a scanner at home, but probably i could ask my wife to scan the rulebook if it helps you. Is there a specific reason, why you don’t have the rules version indicated anywhere apart of the cover page? I did attempt to put the version number on the actual sheets at one stage, but I kept forgetting to update the number when I updated the sheets, and it just caused confusion. I recommend keeping a copy of the original PDF so you know which version you have. How come no love for the advance mystery chart? I only have a copy of the rules and didn’t get that chart. Is it really necessary for it to be on the summary? v3.1 now includes the chart! Any chance you will create a template for a game insert for this game? I’ve made one, but sadly my copy is in storage at the moment and may be there for a while to come yet.